Ah, babies are unpredictable. 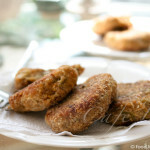 The first time I made these vegetable patties, my son scarfed them down. Crispy and soft inside, I handed them to him hot off the stove and he couldn’t get enough. I was thrilled. It’s not like he doesn’t eat vegetables, but he’s given to bouts of pickiness and it always makes me happy when he eats more vegetables, you know? And all those lovely fresh herbs! So like any mother, I made these patties again. But oh, the fickle nature of 1-year-olds. He gleefully smashed one between his hands, and watched it crumble to pieces. I tried again. He turned his head as the patty approached. Some might have made it into his mouth. A significant amount made it onto the floor. An even larger amount was left over. Fortunately, these aren’t only for children — there’s no reason adults shouldn’t enjoy them as well. Spinach and mixed herbs — dill, parsley, cilantro and green onions — add freshness, while cauliflower and zucchini lend sweetness. The vegetables are slowly stir-fried until lightly caramelized, before being formed into little patties and fried into bite-sized pieces with crispy exteriors. Really, when my son doesn’t eat these, I shouldn’t be complaining. More for the rest of us, after all. Finely chop the cauliflower and onion, and coarsely grate the zucchini. Put the vegetables in a pan with some oil for frying, and let cook until all the vegetables are lightly browned and somewhat soft (I know people generally start with onions, but I really don’t think it matters here — everything needs to lightly caramelize). The pan will be quite full, so you’ll have to stir intermittently so that all the vegetables cook. Chop the spinach and the herbs (dill, parsley, green onion and cilantro), and add to the pan. Cook for a few more minutes, stirring to incorporate, until the greens have become limp and reduced in volume. Scoop the vegetables into a bowl, and mix with the spices (salt, pepper, paprika and cumin), the breadcrumbs or matzo meal, and the egg. Reheat the pan on a medium flame, adding enough oil to cover the base. Scoop spoonfuls of the batter into the pan, pressing down slightly to flatten into patties. Once they’re browned on the bottom, flip to cook on the other side. Once both sides are cooked, remove to a plate lined with paper towels to blot up extra oil. Repeat with the remainder of the better. 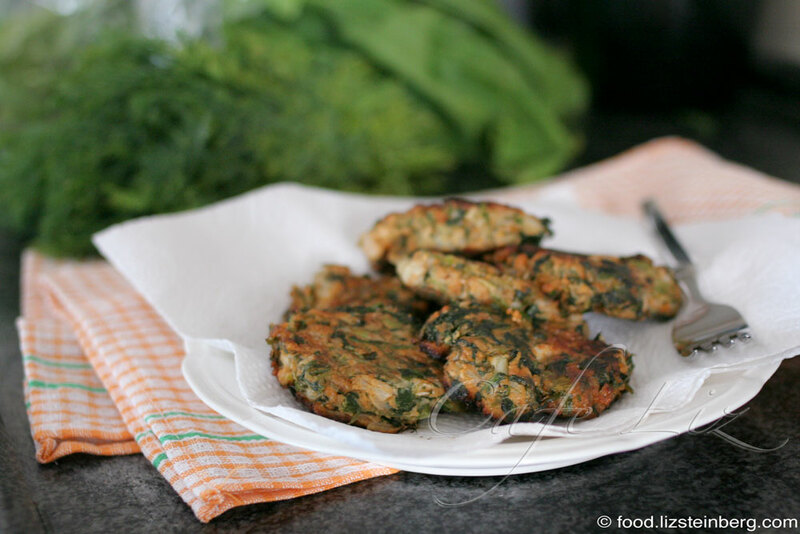 7 Responses to "Vegetable patties with spinach and herbs"
A delightful recipe already planned for the weekend! Just cauli and matzo meal to get at tomorrow’s shopping 🙂 ! Then the first try and slip > my permanent recipe book, I am certain! Love using matzo meal: altho’ not Jewish, I learned from my husband to make most meat patties.loaves with it also: the matzo + a little soda water > magic!! I used to make similar patties for my babes with cooked carrots, zucchini and cauliflower from my chicken soup. I’ll try your recipe for the grownups! I’m not vegan, vegitarian but a wholefoods eater and cook. 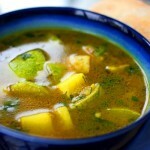 your recipes sound really great and I will start using some of your tips. my favorite is to lightly fry the herbs then adding to the steamed vegitables. Now a question, have you ever found rutabaga in Israel? I live in the north – near Akko. Abiba, I haven’t, but I’ve also never looked. Good luck! I made your broccoli fritters last week for Shabbat and they were a huge hit! 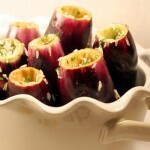 I’ll try these now this week, and may even add some feta cheese to them… Can’t wait!